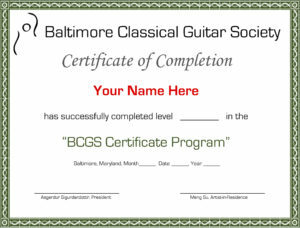 This initiative seeks to establish an educational Guitar Certificate designed to cultivate and promote classical guitar education in the greater Baltimore area and throughout the state of Maryland. We also welcome students from our neighboring states. Moreover, this initiative serves to develop a sense of unity among the numerous guitarists and educators in the area, so as to further promote mutual educational objectives. Students of all ages and levels of ability are welcome to participate. Participants will be evaluated on a set of graded requirements, ranging from levels 1-15. Upon successful completion, students will receive written feedback from professional educators, as well as a certificate for their participation. -Two prepared pieces to be selected from Repertoire List. Students may propose alternative repertoire for the level to which they are applying, at the time of application. Here is a list of scales as well. Where can I obtain the music for my level? We have selected music from the standard repertory and you should be able to find the required scores wherever you regularly purchase music. In many cases, the required music is already in the public domain and may be found for free on IMSLP. We have also included a link to the music in the Repertoire List when the music is in public domain. Here is a link to the scales. Do I already need to be really good at the guitar to participate in this? The Certificate Program is open to guitarists of all ages and abilities! Please see the Repertoire List in order to determine which level is most appropriate for you. Does my music need to be memorized? You will receive higher overall marks for music that is memorized, but it is perfectly acceptable to perform with the music. You can access the evaluation rubric at this link. There is no formal dress code, but it doesn’t hurt to look nice! Remember the way a musician presents themselves contributes a great deal to the overall performance. How long will the evaluations last? Each evaluation should last approximately 10 minutes. Is this a public performance? No, this is not a public performance. Each student will present their prepared repertoire in front a small and private jury of guitarists selected by the BCGS. What will I get for participating in the Certificate Program? Everyone who successfully participate will receive an official certificate, signed by the President and Artistic Advisor of the BCGS. Additionally, you will receive comments from the jury members with suggestions for how to continue improving your understanding and ability as a guitarist. Click on this link “Repertoire List” for a list of pieces and their corresponding levels. These pieces are suggestions only; you are welcome to perform any pieces that you like, but you need to contact us beforehand to clarify within which level your pieces will fall. Here is a list of scales. Please put information on the music you will be performing (full name of the piece and movement if appropriate, the name and dates of the composer) in the box under “Additional Information” on the check-out page when registering. You can also include any other information such as how long you have been playing and who your teacher is, if you wish. Parking couldn’t be easier, it is right across from the entrance to the Center for the Arts, in lot 8. Just a few steps away. Looking for a place for brunch / lunch after the auditions? Check out these restaurants who are only a few minutes away from UMBC. 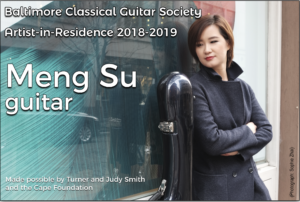 We are happy to announce that Meng Su, BCGS Artist-in-Residence, will be a juror for our first guitar certification on May 12, 2019. Sign up now to perform and you will receive a positive feedback from her about your guitar playing, as well as a certificate for participation.